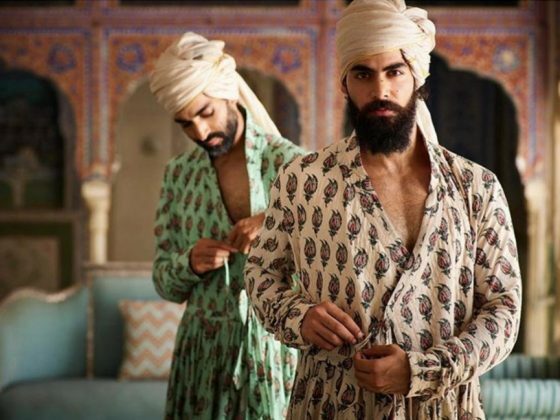 We’ve all been glued to Instagram only to witness what will, in time become Sabyasachi’s most covetable collection. He has made a tradition out of this, with his last few seasons’ collections getting launched on his Insta-feed, instead of the runway! 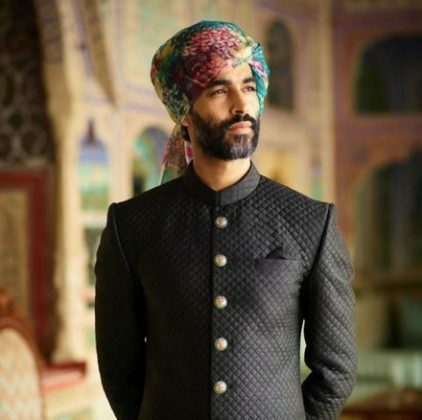 Sabyasachi has become such a popular choice for brides that the brand has dedicated an Instagram handle just to share images of real brides on their big day. The designer is known for working on never thought concept before. 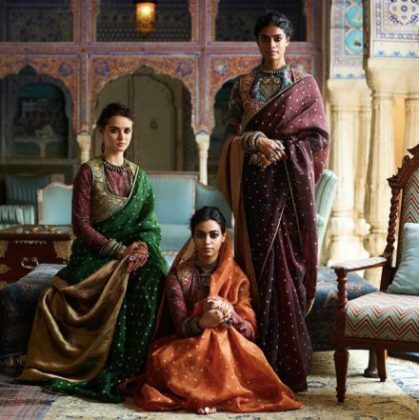 In the case of ‘Kesribai Pannalal’, Sabyasachi Bridal collection 2018 is designed to bring back indigenous crafts that were dying due to industrialisation. 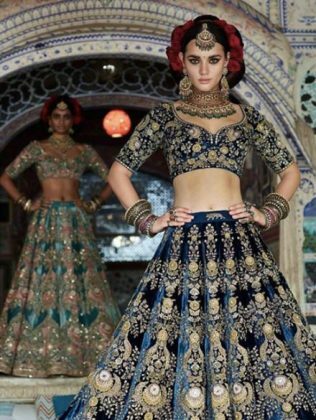 So while you ogle over the beautiful lehengas and stunning jewellery, do take notes of what’s going to hit bridal trend this year. Just scroll our gallery. This year collection includes bridal lehenga lavishly hand-embroidered with silk-floss and beaten silver thread and studded with semi-precious stones, beads and pearls. 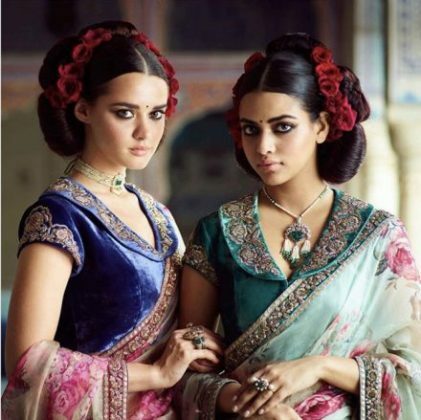 Iranian turquoise and Rich indigo velvet lehenga’s embroidered with zardosi. A ‘Kumquat’ lehenga hand-embroidered with silk-floss thread, zardosi and rhinestones and framed with heritage zardosi borders. Men in printed khadi angrakhas and silk Kota turbans. Collection also included a baroque jacket in ivory and Iranian turquoise silk that is first hand-painted, then appliquéd with tea-dyed velvet and over-layered with the finest of zardosi, coffee-stained pearls, rhinestones, crystals and semi-precious stones. Designer’s thought behind this amazing collection, “Not long ago, much before the advent of the internet, indigenous crafts and textiles were traded by family-run businesses. Most of them had little or no access to global markets and technology. Spanning several generations, these businesses might not have been great at marketing themselves, but due to a specialization of labour and skills, they managed to uphold purist tradition and unparalleled quality of craft. With the onslaught of the new digital age, quality soon became secondary to marketing and tradition was muscled out by globalization. But things with deep-rooted foundations die temporary deaths, only to return stronger than ever. India is witnessing that now. 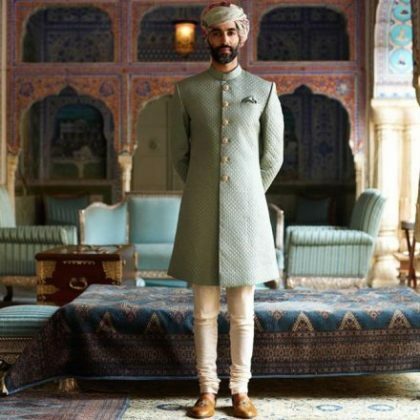 This was his new and an open way to bring everyone’s focus on traditional clothing. And let all the would-be-brides fall in love with their regions and traditions in a new and elaborated form.